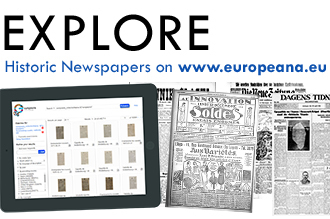 The refinement partners in the Europeana Newspapers project will produce the astonishing amount of 10 million pages of full-text from historical newspapers from all over Europe. What could be done to further enrich that full-text? The KB National Library of the Netherlands is the project partner leading the work on refinement and explains you all about Named Entity Recognition in this article. The KB National Library of the Netherlands has been investigating Named Entity Recognition (NER) and linked data technologies for a while now in projects such as IMPACT and STITCH+ and we felt it was about time to approach this on a production scale. 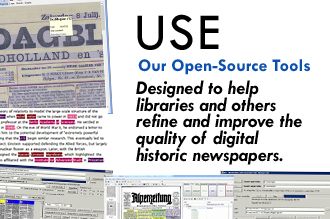 So we decided to produce (open source) software, trained models as well as raw training data for NER software applications specifically for digitised historical newspapers as part of the project. Named Entity Recognition is the process of identifying and classifying entities such as persons, locations and organisations in the full-text in order to enhance searchability. There are basically two types of approaches, a statistical and a rule based one. Rule based systems rely mostly on grammar rules defined by linguists, while statistical systems require large amounts of manually produced training data that they can learn from. While both approaches have their benefits and drawbacks, we decided to go for a statistical tool, the CRF-NER system from Stanford University. In comparison, this software prove to be the most reliable, and it is supported by an active user community. Stanford University has an online demo where you can try it out: http://nlp.stanford.edu:8080/ner/. 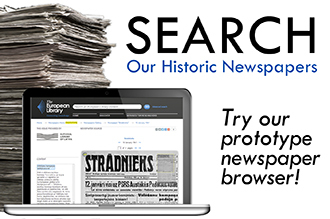 There are some particular requirements and challenges when applying these techniques to digital historical newspapers.Since full-text for more than 10 million pages will be produced in the project, one requirement for our NER tool was that it should be able to process large amounts of texts in a rather short time. This is possible with the Stanford tool, which as of version 1.2.8 is “thread-safe”, i.e. it can run in parallel on a multicore machine. Another requirement was to preserve the information about where on a page a named entity has been detected – based on coordinates. This is particularly important for newspapers: instead of having to go through all the articles on a newspaper page to find the named entity, it can be highlighted so that one can easily spot it even on very dense pages. Then there are also challenges of course – mainly due to the quality of the OCR and the historical spelling that is found in many of these old newspapers. In the course of 2014 we will thus collaborate with the Dutch Institute for Lexicology (INL), who have produced modules which can be used in a pre-processing step before the Stanford system and that can to some extent mitigate problems caused by low quality of the full-text or the appearance of historical spelling variants. We repeat steps (2) – (6) until the results of the tagging won’t improve any further. These figures have been derived from a k-fold cross-evaluation of 25 out of 100 manually tagged pages of Dutch newspapers from the KB. The results confirm the fact that the Stanford system tends to be a bit “conservative”, i.e. it has a somewhat lower recall for the benefit of higher precision, which is also what we wanted. 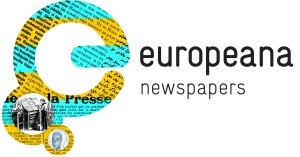 Within this final year of the project we are looking forward to see in how far we can still boost these figures by adopting the extra modules from INL, and what results we can achieve on the French and German newspapers. We will also investigate software for linking the named entities to additional online resource descriptions and authority files such as DBPedia or VIAF to create Linked Data. The crucial question will be how well we can disambiguate the named entities and find a correct match in these resources. Besides, if there is time, we would also want to experiment with NER in other languages, such as Serbian or Latvian. And, if all goes well, you might already hear more about this at the upcoming IFLA newspapers conference “Digital transformation and the changing role of news media in the 21st Century“. This entry was posted in News and tagged ALTO, Linked Data, NER, OCR by eurnews. Bookmark the permalink. Can I use these tools and same methodology for Urdu and Sindhi languages?